Is blink the word or is it panic? At any rate, everyone was pleading for Bernanke to do something so he did. The Fed Cuts Rate 0.75 Percentage Point in Emergency Move. The Federal Reserve lowered its benchmark interest rate in an emergency move for the first time since 2001 after tumbling global stock markets and a jump in U.S. unemployment threatened to push the economy into recession. The central bank lowered the benchmark overnight lending rate to 3.5 percent from 4.25 percent, the Federal Open Market Committee said in a statement in Washington. Policy makers weren't scheduled to gather on rates until Jan. 29-30. "While strains in short-term funding markets have eased somewhat, broader financial market conditions have continued to deteriorate," the Fed said in a statement in Washington. The FOMC took the action "in view of a weakening of the economic outlook and increasing downside risks to growth." Correction: Bernanke should have said downside risk to contraction. There isn't going to be any growth. 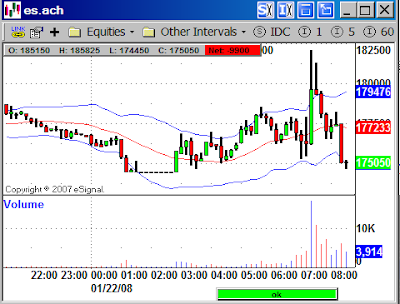 The announcement came at 7:00 AM and the futures initially reacted as if a 75 basis point cut matters. Here are a couple of charts. 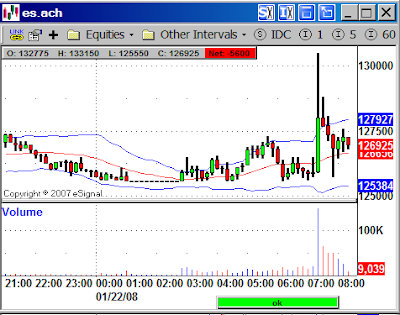 Shortly after the open of the regular session there was massive short covering. This could hold for an hour, or even a day or even several days. Nothing that happens today will surprise me. We could close green or have a “second thoughts” selloff into the close. But the difference between an emergency rate cut today and the same rate cut a week from today is meaningless. What good will it do? The question is one of solvency not, liquidity. By the way, panic short covering here will do nothing but leave a huge pocket of air beneath if this rally fails. That is the real risk if this rally fails to take hold. Here is the Press Release from the Fed. What a bunch of fluff. The Fed acted like things are an emergency but put out a press release as if it's not.